Social and emotional learning is more than a side curriculum—it should be woven into everyday activities throughout the school day. As a new teacher nearly a decade ago, I was handed a curriculum for social and emotional learning (SEL) and instructed to teach it twice a week during advisory. I did so as best I could. My middle school students were ethnically diverse, but in ways that didn’t match the students in the videos. My students dealt with very different racially charged terms, being that we’re in Hawai'i. We had been given a research-based curriculum to combat a rise in complaints of bullying, but the curriculum was not culturally relevant to our students. It was only when I was brave enough to go off-script and engage with my students about the terms they heard thrown about at recess, the insults they endured, and the cutting remarks they admitted to saying about one another that we were able to stare directly into our own biases and grow our own social awareness. I began to wonder what could I do in my content classroom to promote relationship building and responsible decision-making. Middle level students need to practice these skills more often than twice a week. Since then I’ve learned that SEL is ideally more than a curriculum—it’s a set of thoughtful strategies embedded into everyday classroom activities and norms. In the best-case scenario, students should be given multiple opportunities throughout the school day for practicing self-awareness and self-management, increasing social awareness, building relationship skills, and making responsible decisions. 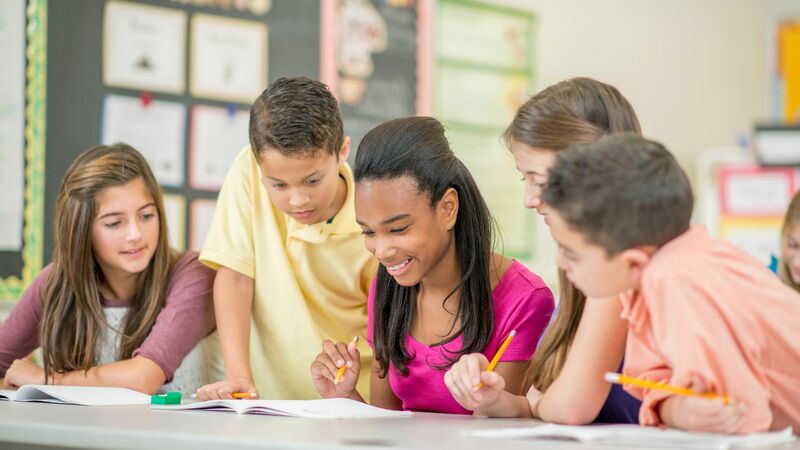 SEL is not the practices themselves—the connected practices collectively build and contribute to SEL skills. SEL is ideally interwoven into classroom practices such that it would be hard to tell SEL activities apart from other routines. I’m currently an assistant principal, but I used several practices in the classroom to achieve this interweaving, and I’ll use them again next fall when I go back into the classroom. 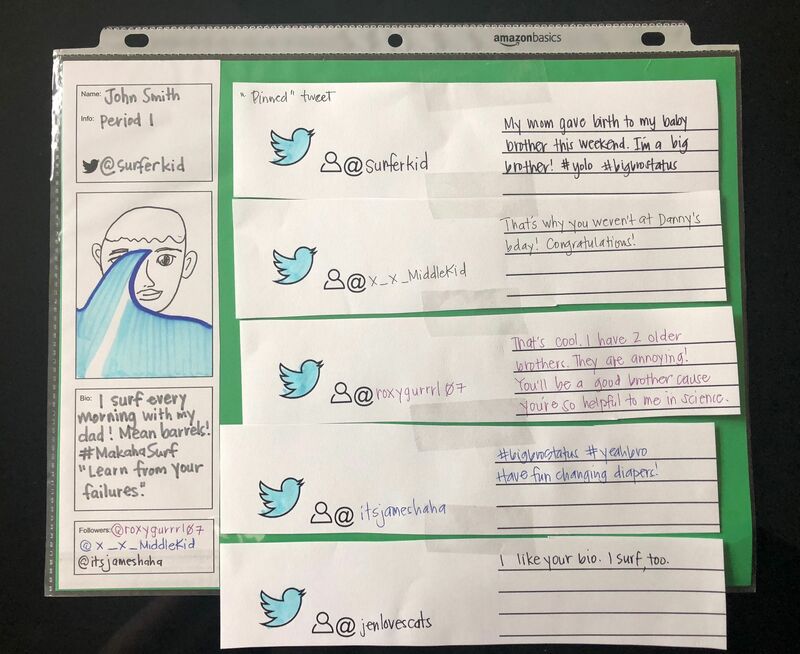 Paper tweets: I used a paper and pencil version of Twitter in class, an exercise in which students would initially connect with a friend, an acquaintance, and a classmate with whom they rarely spoke. Sometimes I used this for formative assessment, but it also worked as an SEL break—students wrote and discussed anything they wanted with their peers. I didn’t read or assess this writing—it was solely for students. I often had students write whatever they wanted as their initial “tweet,” and then respond to the three peers they were “following.” Sometimes I had them respond to as many peers as they wanted. One of their favorite steps was adding heart stickers to their favorite comments. I also created my own profile, which students could use to ask me questions, which I would answer aloud. This was a comfortable form of engagement for introverted students. Check in before you check out exit passes: Last year, I starting using exit tickets daily to ask students questions like: How are you feeling? What’s new with you? What do you want to share with me? I was surprised by how many students wrote that they were sad, bored, or upset when they seemed engaged and outwardly happy, but at least asking these questions allowed me to address their emotional needs more quickly and more often. After doing this for just a few weeks, I got to know my students really well, much faster than I had in previous years. Several students wrote to say that their favorite thing about my class was that I checked in with them every day and they were able to tell me how they were feeling. Group one-pagers: In groups of four to six, students would create a sheet called a one-pager with their team name, group favorites such as food and movies (or any other favorites you’d like to ask them about), and a symbol to represent each member of the group. They also listed their favorite meme. I had students do this on large poster paper, and it served as a kind of group flag. I would take a picture of each poster and post them around the room—the posters themselves would have taken up too much space, but it’s very important to give students in the middle grades a sense of identity and belonging. Relationship-building one-pagers: Students also created one-pagers about one of their peers or an adult on campus. On a piece of white printer paper, they would draw an image of the person and write their name, and then ask three peers for positive quotes about that person. Next they would draw three funny or meaningful images, and share two inside jokes or memories of the person. Then they would write a thoughtful, made-up definition of the person’s name. Finally, they created a border in writing around the page with three or four adjectives to describe the person. Observing my students creating these one-pagers was simply exquisite. Some of them selected security guards, others picked educational assistants, and of course, many chose their peers. At the end of the assignment, students delivered their one-pagers to the person who inspired them. It was touching to see the many tears from adults who were surprised that students appreciated them. Student-led end-of-quarter celebrations: I gave students the freedom to create class-bonding celebrations. They selected themes, created potluck sign-ups, made invitations, and set up activities like a cupcake-decorating challenge or group craft projects. Some of the most memorable activities were a karaoke party with a strobe light, a fashion runway walk-off using materials like garbage bags and paper bags, a school-wide scavenger hunt, an escape room challenge, and a blindfolded makeup challenge. This was an assignment, not just a party. I gave my students a rubric and examples of successful celebrations. I made clear that I expected them to create a bonding activity in which all class members would want to participate, and from start to finish the celebration could take up no more than 30 minutes. If we had a lot of time to plan, we would also invite other teachers and even the principal to celebrate with us.